Consider this: The guy who gave us “Mona Lisa” and “The Last Supper” was a part-time painter. He spent most of his day dreaming up flying machines and other engineering marvels to please Renaissance bosses in Italy and France. His peers considered Leonardo da Vinci the most dazzling polymath in history, and opinion hasn’t changed over five centuries. 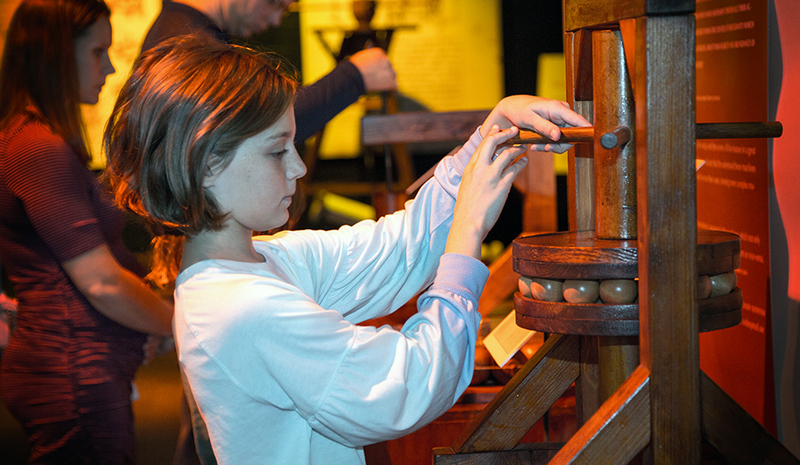 You’ll see why in “Da Vinci’s Machines,” a touring exhibit at Discovery Place Science in Charlotte through May 6, 2018. Duke Energy presents this collection of 75-plus designs, models and reproductions of artworks. That’s logical: With imagination, you see how da Vinci’s concepts show up today. “Few of his sketches are blueprints ready to be followed to make working machines,” Rizzo said. “Most are … experiments or concept designs, and many are incomplete; sometimes he did this intentionally, to protect intellectual property. So they take some interpretation. The exhibit begins with a faceless Mona Lisa, which entices you to stick your head through a hole for a selfie. Surprises lie just beyond. The genius we know shows up beyond this tribute to mayhem. Da Vinci was the original STEAMer – science, technology, engineering, art and math – and nothing in nature was too inconsequential to interest him. He envisioned anything from vast machines run on ball bearings to a night clock: Depending on humidity, temperature and the design of wick and wax, he could measure time by watching a candle burn. Leonardo da Vinci's representation of Archimedes Screw, which draws water upward. Modern engineers will smile at predecessors of their own tools. Da Vinci didn’t conceive the Archimedes Screw, which draws water upward to produce hydroelectric power, but he made it feasible. Today, Duke Energy’s Bad Creek Hydroelectric Station in Salem, S.C., can use this principle to supply 850,000 homes with energy from an underground plant. Da Vinci worked with robots, often for theatrical stages, finding ways to apply body movements to mechanical devices. Such plans led gradually to robot arms used in places where human limbs would be unsanitary or endangered. He designed a primitive helicopter and pioneered flying machines – some meant to be operated by humans, others not – in the first recorded attempt at a drone. Duke Energy uses drones to inspect solar installations, large boilers at power plants and other locales where human interaction is inefficient or dangerous. What will surprise visitors most, even longtime fans of da Vinci? Rizzo thinks it’s his universality. 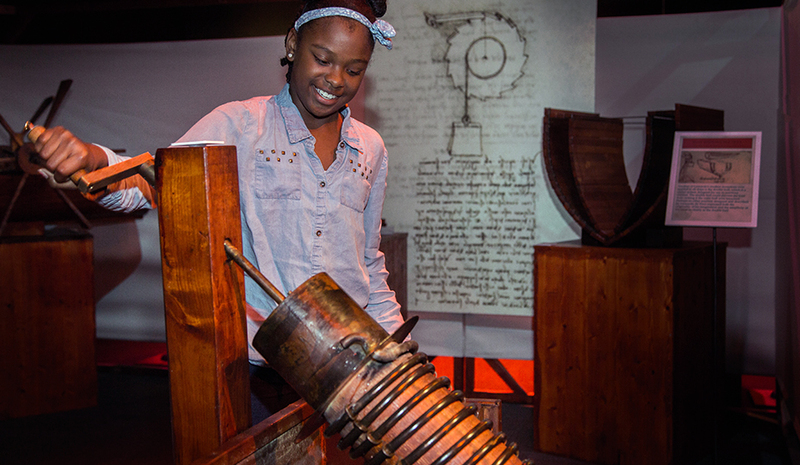 You can try out da Vinci's ball bearing model at the exhibit at Discovery Place Science in Charlotte, N.C.
“I hear a lot of people say Leonardo never finished anything: So many of his designs are incomplete, his paintings unfinished and his books unpublished. But I think this is an unfair assessment.